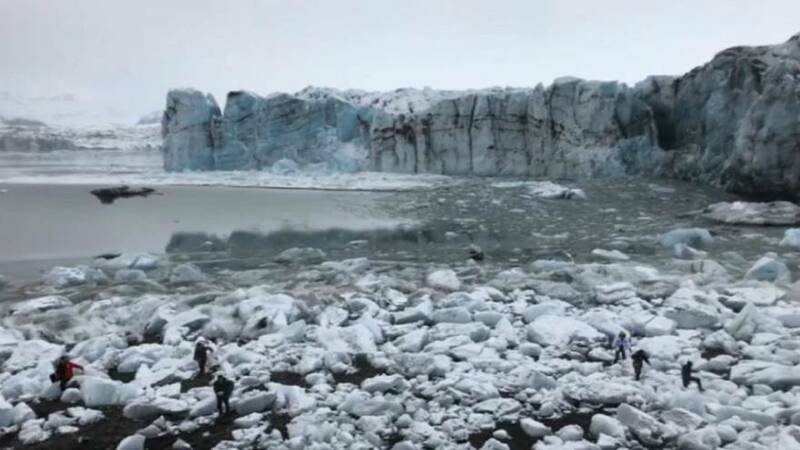 Tourists admiring a glacier in Iceland had to flee on Sunday after big slabs of ice collapsed triggering a large wave. About a dozen people were observing the Breiðamerkurjökull glacier, part of Jökulsárlón glacial lagoon in southeast Iceland, when chunks fell in the water below creating a large wave rushing towards the shore. All the tourists appear to have made it to safety and no one was reported injured. Stephen Mantler, a mountain guide for the Háfjall tour company, captured the footage. He described the calving as "one of the largest and closest we've seen this winter!" "Also a good illustration why we always tell our clients to immediately leave the beach if the glacier calves", he added.